Are you prepared for 2019? 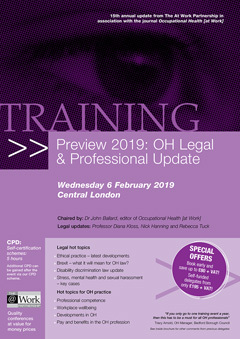 Do you know the legal and professional developments that will be affecting your work in occupational health over the next 12 months? This is one of our most popular annual events, attracting delegates from the UK and overseas who wish to keep up to date with all of the most recent changes in OH law and practice. Pay & benefits – are you getting enough? What’s happening to occupational health? Stress – where are we now? 24/7 working – whose responsibility? Book early and save up to £80 + VAT! Self-funded delegates from only £195 + VAT!